An inspirational gardener and teacher from Virginia shows us her incredible journey discovering the true meaning of Slow Fashion, by producing a cotton shirt… from scratch! Zoe Burt and Kate Poland created the “Grow a London Garment” project nearly two years ago. I discussed how this amazing concept brought hundreds of people in London city together to make a slow garment from scratch, in my previous post here. This effort resulted in a piece of clothing that took sustainability to a whole other level. From growing linen, to harvesting it, converting it into thread, spinning it into fibre and transforming it into the end garment, every step of the manufacture was green. It was indeed a zero carbon footprint product that proved sustainability can be realised at every level of garment manufacture, when we are committed to doing it right. Now Cindy Conner, a bio-intensive gardener and permaculture teacher in the states has demonstrated this concept all over again. By home-growing a cotton shirt from scratch, she shows us that even home sewers can participate in the purest form of slow fashion. Let me tell you all about Cindy’s successful venture. 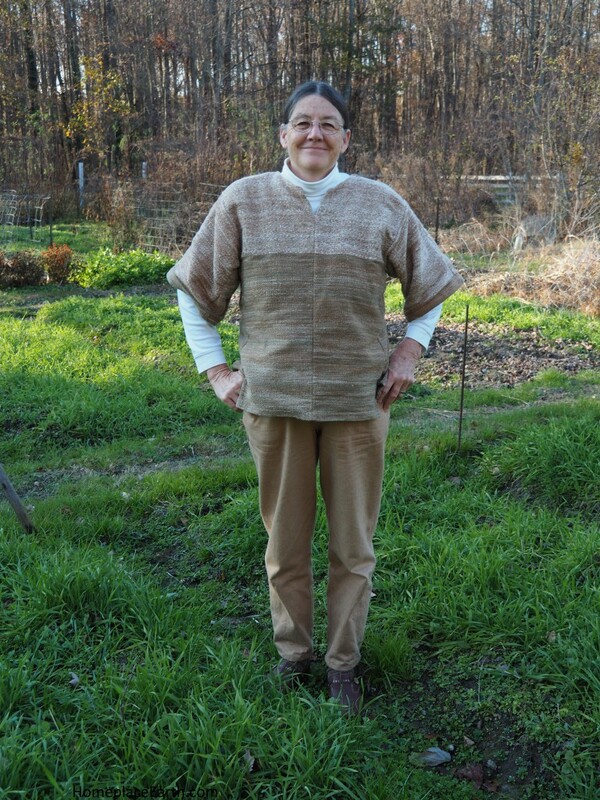 Cindy Conner #gardener and #permaculture teacher grew her own #cotton and made clothing! Cindy is an ardent advocate of sustainable food practices, and is passionate about living lightly on the earth. She is the founder of Homeplace Earth through which she endeavours to promote local and sustainable food. Her research includes finding methods to grow food in small spaces in eco-friendly ways, authoring two books: Grow Sustainable Diet and Seed Libraries. Her work with fibres such cotton and flax is a recent endeavour. Although she grew her own cotton as early as in the 1990s, her attempts at spinning it began only in 2011. Cindy’s first clothing project was a homegrown vest with cotton from Erlene’s Green and Nankeen Brown cotton seeds. Growing the cotton was the easy part of this laborious project! Cindy knew neither how to spin nor weave when she came up with the idea of making her own clothes. So, she had to learn these first, to take her idea forward. She acquired the necessary knowledge by attending meetings of the Clothos Handspinners group and following various DVD tutorials. To spin the cotton into fibre, Cindy used the tahkli spindle. The cotton she grew was naturally brown and green, and the colours deepened when the cotton was boiled after being spun. Cindy retained these natural colours in the vest she made. The weaving was done on a 12” table loom and she created 9½ inch panels that were quilted together to make the vest. Finally, the vest was embellished with buttons that Cindy made herself using shells. You can find more details on this project here and here. After successfully completing the vest, it was time for Cindy’s more ambitious project – a fully homegrown cotton shirt! Cindy in her finished homegrown vest! How Cindy created her own homegrown cotton shirt. As a novice in spinning and weaving, Cindy faced a number of challenges during the making of her vest. When it was time to make the shirt, armed with her experience making the vest, she was careful to overcome these issues. When making the vest, she found that there was some natural mixing of the brown and green cotton. To avoid this, she separated the seeds out after harvesting the cotton this time. It wasn’t an easy task, as the colours are faint until after they have been spun and boiled. Apart from green and brown, Cindy also used naturally white cotton from an older crop to make fibres for the shirt. The green cotton and the brown cotton. See how similar the plants look before they are processed! 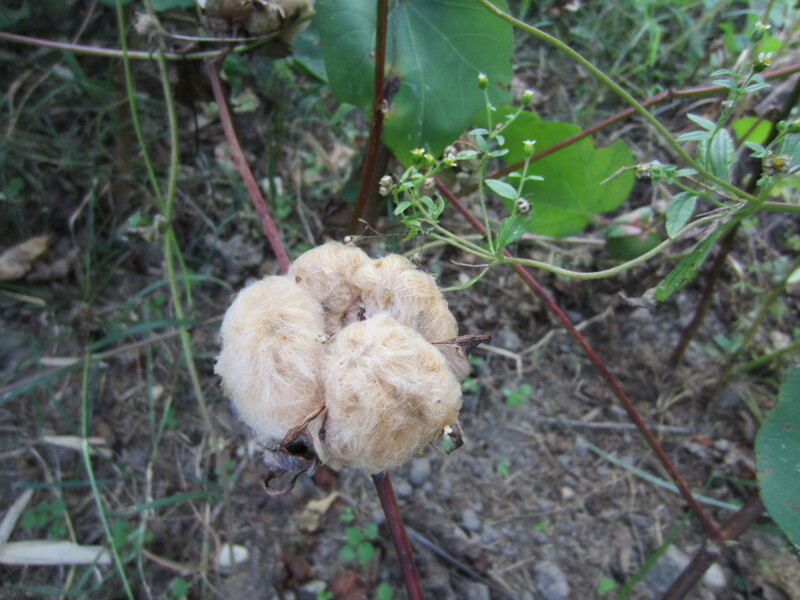 With #homegrown #cotton you can make use of the #natural colours of the plants! #naturalcolour! She used an Indian book Charkha (a type of spinning wheel) for the spinning process this time. After spinning all three colours separately into singles, she plied brown and green together, and brown and white together to make 2 ply cotton that was used for the entire project. 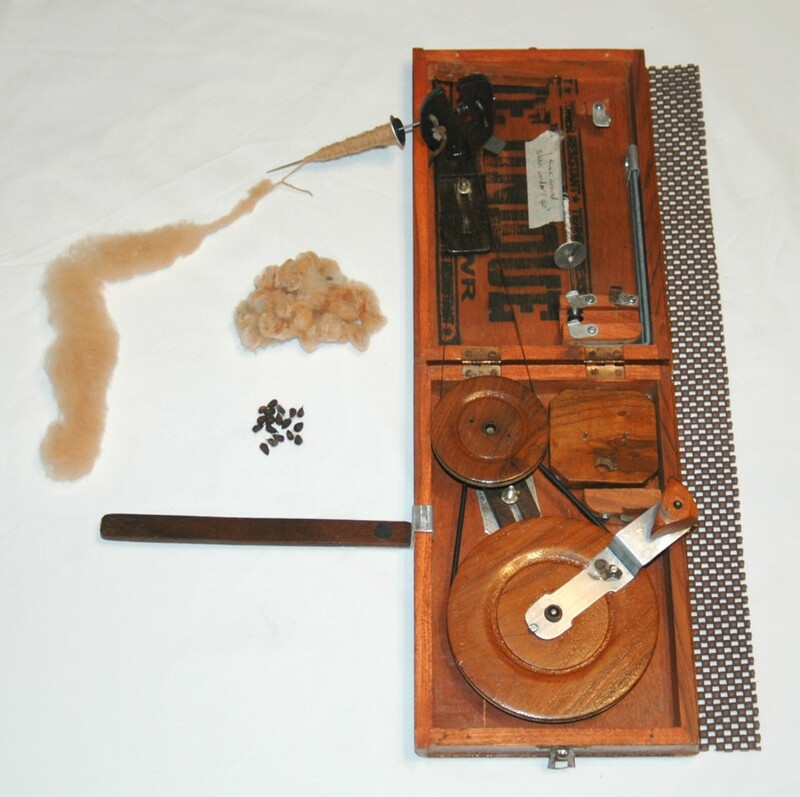 The Indian Charkha book – Cindy’s second spinning machine! Cindy used a vintage clothing design that used straight panels of fabric to make the shirt. This meant she could save as much fabric as possible, and the panels were cut only for fitting around the neck. Using the same loom as the one she used to create her vest, she made panels of 9½ inches in width. Details of the measurements for this low-waste shirt design are available here. There was limited amount of yarn to work with, so Cindy had to carefully estimate how much fibre was to be used at each stage. She also had to leave an allowance for shrinkage of the cotton. After the shirt was finished, all that remained was one ball of green and white yarn. Although the project was time-consuming and had to be carried out meticulously, the results of Cindy’s labour speak for itself. Not only is the shirt one-of-a-kind, it is a shining example of how beautiful a home-grown product can look and feel. The excitement of owning such a responsibly created garment is unbeatable, and the journey towards making it happen is truly inspirational. I was delighted to speak to Cindy recently and ask her some questions about the process. What inspired you move from growing food to growing and making your own clothes? I learned to sew growing up and I sew almost all my own clothes, including jeans. I like to get to the basics of things and have studied what it would take to grow one’s own food sustainably. So, growing plants to make into fabric is a natural progression from that interest in growing food. Also, I believe that everyone and everything is connected. Our choices affect others and the planet. I began thinking about my fabric choices and learning how destructive the whole textile industry is to the earth and to the people who work within it. I had no choice but to learn more about producing my own fibre to cloth myself. Also, this gives me an opportunity to talk of Vandana Shiva and the work she is doing in India with the cotton farmers, and of Ghandi’s work promoting spinning and weaving cotton as a way to independence for India. 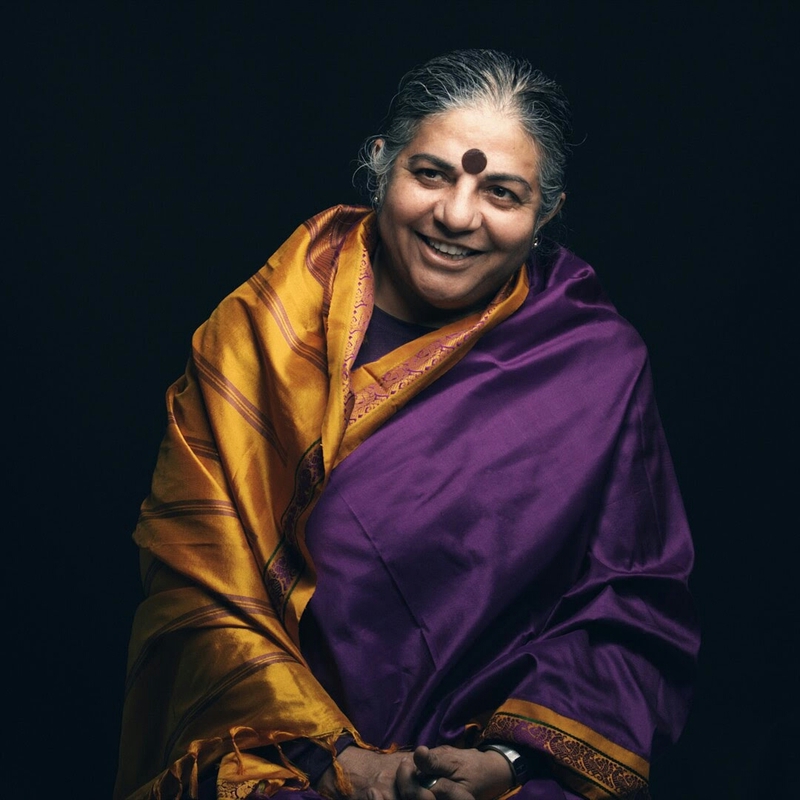 The wonderful Vandana Shiva – environmental activist and anti-globalization author based in Delhi. Image courtesy of Field of View Media from their fantastic video about her. How long did the whole process take from sowing the first seed to wearing your finished shirt? This is not an easy question to answer because getting this shirt made is just part of the process of living and not a start to finish project. If you mean when did I grow cotton for the very first time, that would be in the late 1990’s. I thought it was interesting, but didn’t know quite what to do with it and was busy with other projects at the time. In about 2005 I grew a bit more cotton and put it away. In 2011 I decided to grow it again and take the time to learn to spin. Again, other projects competed for my attention, but I kept at it. After my second book, Seed Libraries, was published, my time opened up to complete a clothing project. 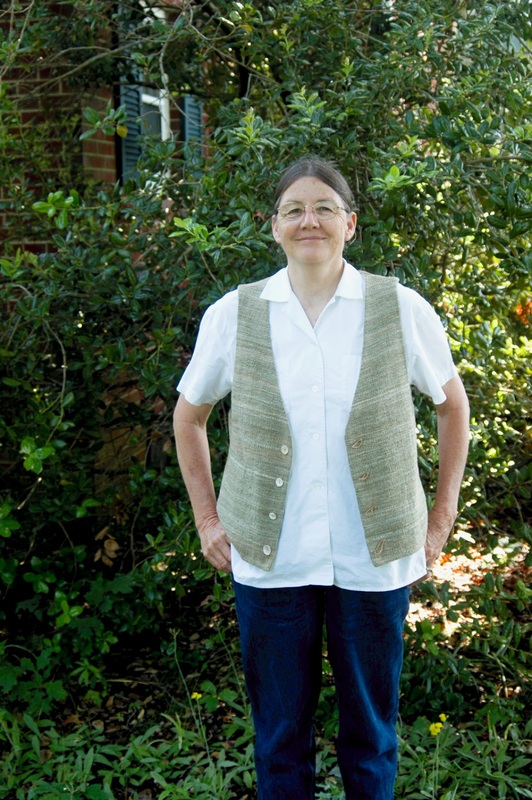 I finished my homegrown, handspun, handwoven, naturally-colored cotton vest in May 2015. 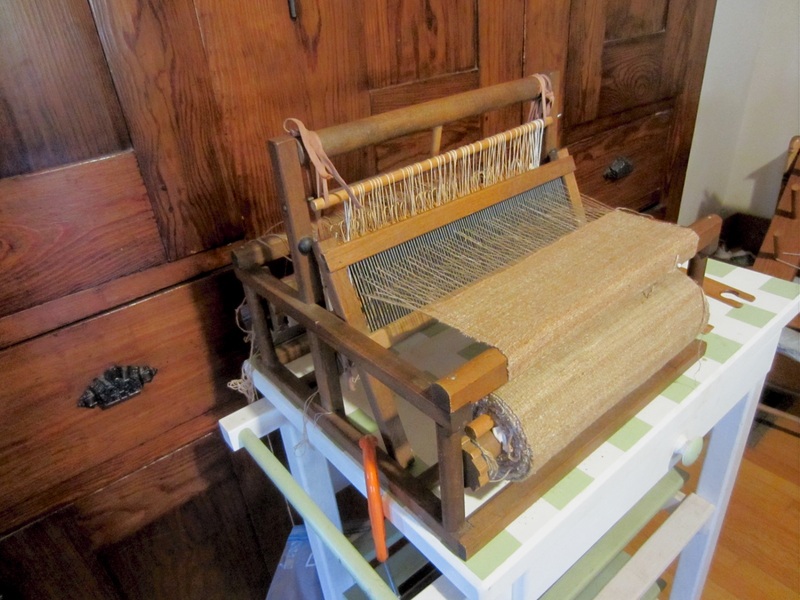 Besides spinning, I had to learn to weave on the small table loom I had acquired. Once the vest was made, I took time off from cotton for other projects, including learning to process flax into linen and to knit a wool sweater. I was just getting back to the cotton when I broke my wrist in March 2016, which slowed me down a bit. The shirt was completed in November 2016. The small table loom Cindy used to weave her cotton. How many cotton plants did it take to make one shirt? Another question that is not easy to answer. There are a lot of variables to how many plants it would take. Here in Virginia in Zone 7 my yields have ranged from 0.3 pound fiber to 1 pound fiber per 100 square feet. I put my cotton plants in at 1 foot apart. The yield could be less if the weather is not so favorable, such as in 2013. I’ve found that the fiber is 1/4 the harvest and the seeds 3/4, but the yields I mentioned are for fiber only. My shirt weighs 14 ounces and both the warp and the weft are from my homegrown cotton. In regions more suitable to cotton it may be possible to make a shirt from only a few plants. The U. S. average for cotton grown commercially is about 1.7 pounds fiber per 100 square feet. The cotton for my shirt was from more than one harvest and was used for other small projects along the way, so I don’t have an exact number of plants for the shirt, but these figures give you an idea. What were the biggest challenges in growing your own garments that someone ought to know before attempting a similar project? Growing your own clothes takes many kinds of skills. I already knew how to grow things, so it was easy to put cotton into my garden rotation. I also already knew how to sew, including how to come up with my own patterns. I had to design patterns for my vest and my shirt that made the best use of the narrow width of the fabric that came off my small loom. I had to learn to spin and to weave. Of the two, spinning was the hardest, since I wanted to refine my spinning to have nice thin cotton yarn to work with. I already knew how to knit, but I wanted these garments to be woven. 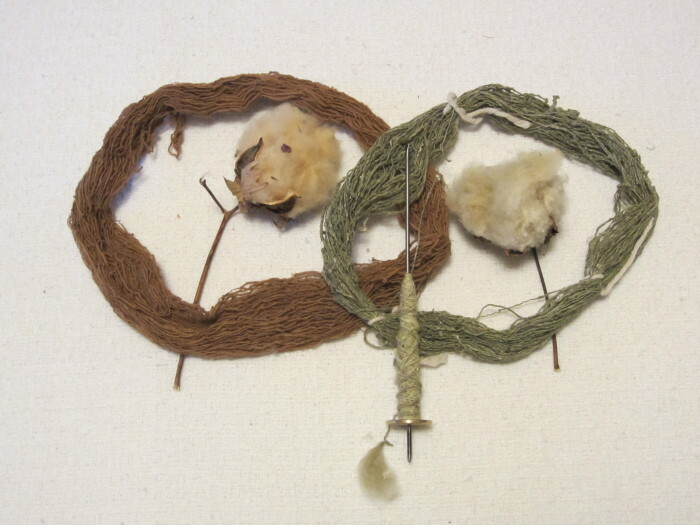 The cotton for the vest was spun on a tahkli hand spindle and plied on a wooden drop spindle. The cotton for the shirt was spun on a box charkha and plied on a spinning wheel. It takes time to learn these skills, so don’t be disappointed if you can’t make it happen as soon as you would like. Enjoy each moment of learning along this journey and celebrate each new accomplishment. Both your home-grown garments were from cotton. Do you have plans to work with another fibre in the future? In January I hope to complete some flax tools and process the flax I grew this year. I’d love to make a linen/cotton shirt, so there are lots of projects in the works. We’ll see how it goes, since everything takes time. Cindy certainly is a real inspiration of self-sustainable, environmentally aware living. If you feel inspired to grow your own clothes, or if indeed you have already, we’d love to know! Cindy’s, then make sure you’re signed up to our monthly newsletter. Please do tweet this article with the links throughout; we really love to spread the word about the possibilities of living so closely with Planet Earth.